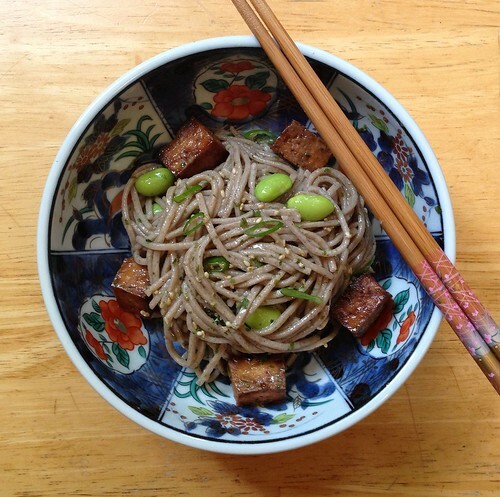 Since the Japan Night dinner was in the middle of a heat wave, we decided to make a cold soba noodle salad with baked tofu and edamame for the main entree. For the actual event, we bought pressed tofu and marinated and baked that, but when I tested the recipe at home, I first pressed my own tofu. 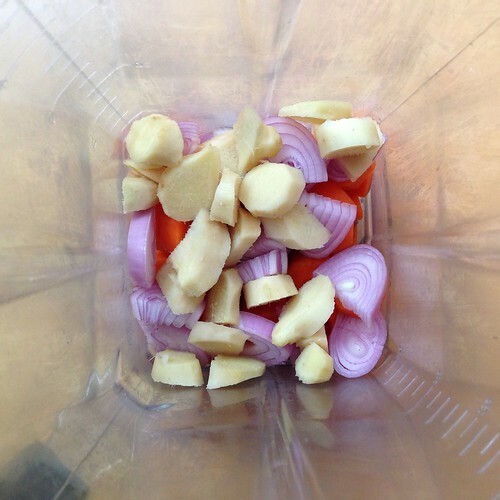 To do this I first drained a package of firm tofu (you can also use extra-firm). Then I lined the bottom of a bowl wide enough to fit the tofu in with paper towel, placed the tofu on top of the paper towel, and topped the tofu with another layer of paper towel. On top of that I placed another bowl and put some heavy cans in it. After 15 minutes you should see a significant amount of water at the bottom of the bowl. I usually drain this off and replace the (completely wet at this point) paper towels and keep pressing for another 15 minutes of so. The process of pressing the tofu removes a lot of the water in it so when you marinate it, it will soak up a lot more flavor. 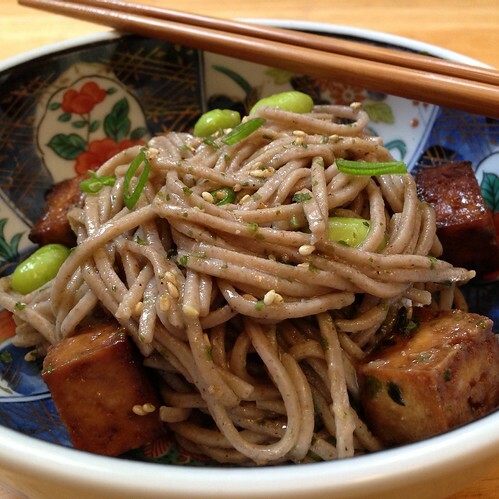 I marinated the tofu in a mixture of soy sauce, sesame oil, mirin, honey, and crushed garlic. After a 30 minute soak in the marinade, the tofu gets baked for about 40 minutes and develops a nice crispy crust while maintaining a soft, almost custard-y center. 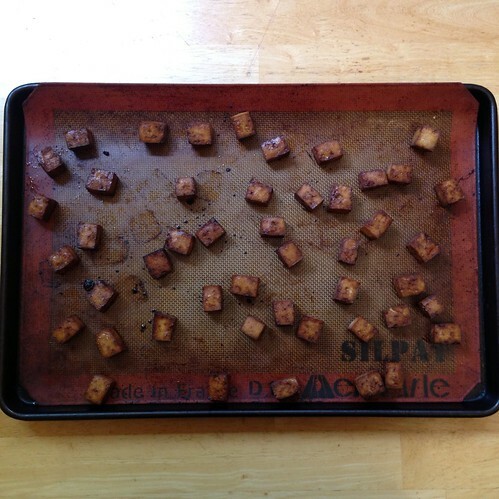 For this recipe I cut the tofu into half-inch cubes before marinating them so they were almost like croutons, but when I make baked tofu to snack on, I'll usually keep them in bigger slabs. Press the tofu for 30 minutes (directions above). Cut into half-inch cubes and place in a large Ziploc bag. 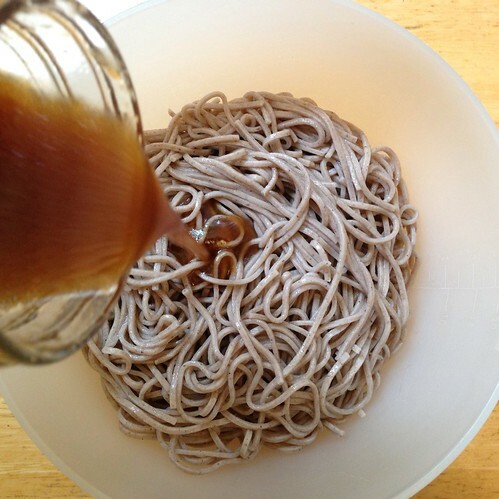 Mix together the soy sauce, mirin, honey, and sesame oil. Add the crushed garlic clove and pour into the Ziploc bag, making sure that the marinade covers all sides of the tofu. Marinate for 30 minutes, turning the bag over at least once. Preheat the oven to 350ºF. Cover a baking sheet with aluminum foil and spray with cooking spray or use a Silpat. 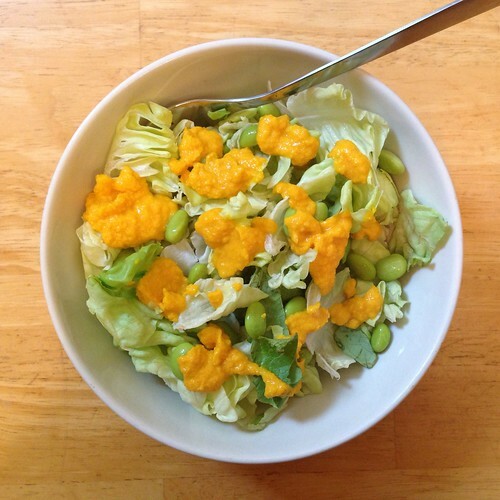 Remove the tofu from the bag, discard the garlic, and reserve the marinade for the dressing. 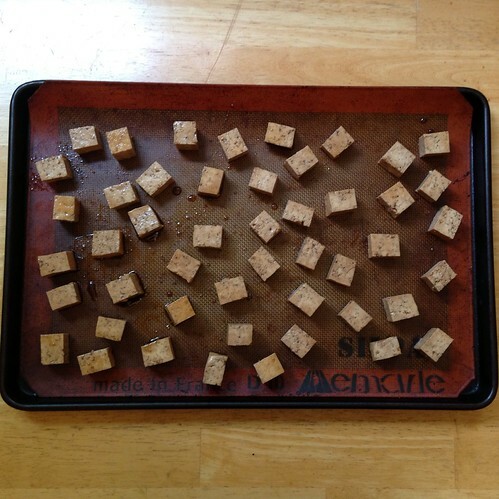 Spread the tofu evenly on the prepared baking sheet. Bake for 10 minutes, then flip them over. Continue baking and flipping every 10 minutes until the total baking time reaches 40 minutes. Remove from oven and let cool. Cook the soba noodles according to the directions on the package. 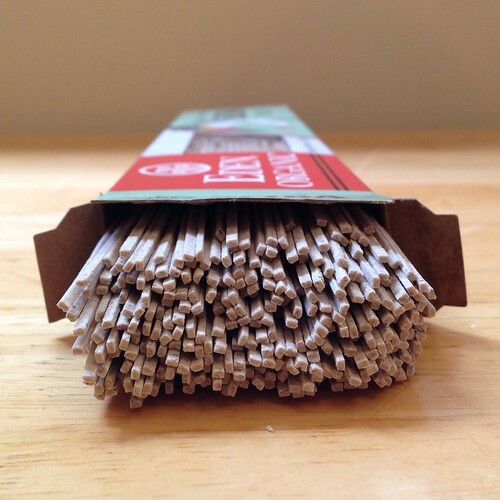 When done, drain and rinse with plenty of cold water so that it cools down and doesn't stick. Transfer noodles to a large bowl. 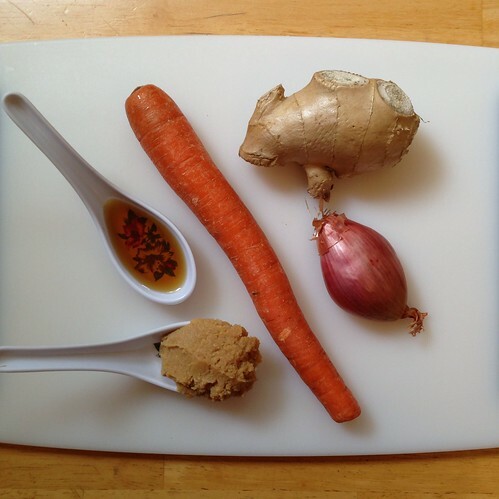 Mix together the reserved marinade, rice wine vinegar, sesame oil, and canola oil. 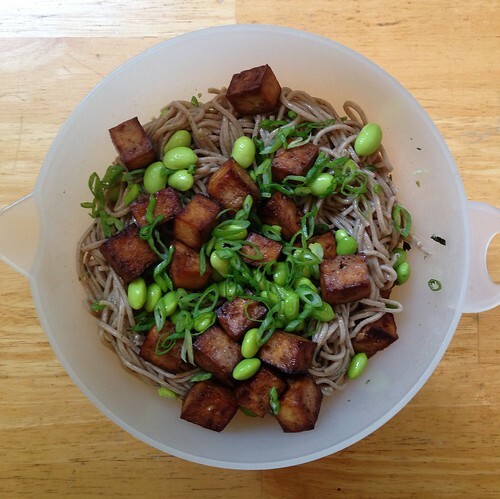 Pour over the noodles and toss with the baked tofu, edamame, sliced scallions, and sesame seeds. 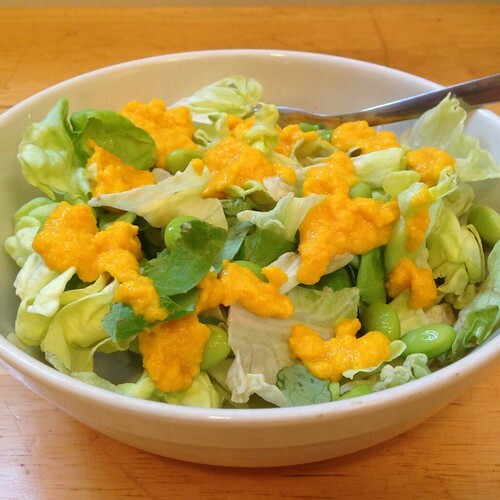 For the actual event, we also added julienned carrots, red bell peppers, and cucumbers to the salad. The spring rolls we bought frozen and just baked them in the oven, but everything else was pretty much made from scratch! 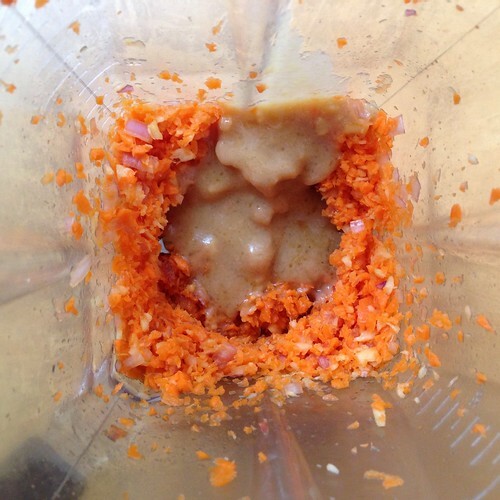 Pulse the carrot, shallot and ginger in a blender until finely chopped. Scrape down the sides, add the miso, vinegar and sesame seed oil and whiz together. While the blender is going, slowly drizzle in the canola oil and the water. 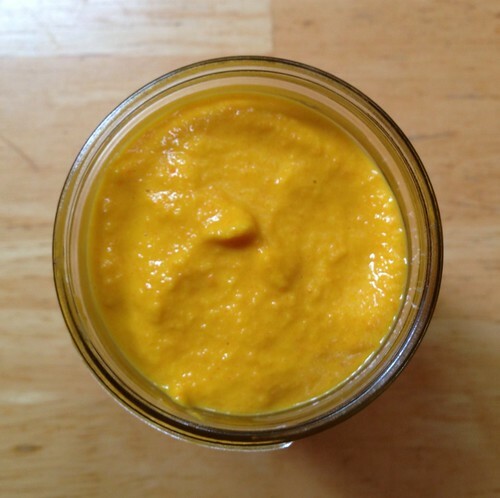 The dressing will keep refrigerated in an air-tight container for about a week. I like to eat this over butter lettuce, but we used a mesclun salad at Japan Night. 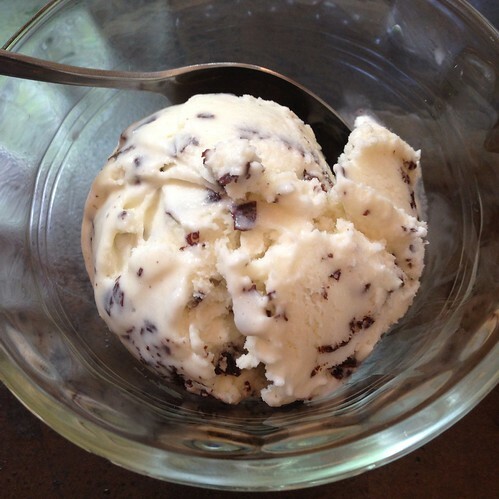 My first time making an ice cream based on Jeni's eggless ice cream recipes was this Peppermint Ice Cream with Peppermint Candy and Dark Chocolate. The idea was a good one, but I wasn't very impressed with the outcome. 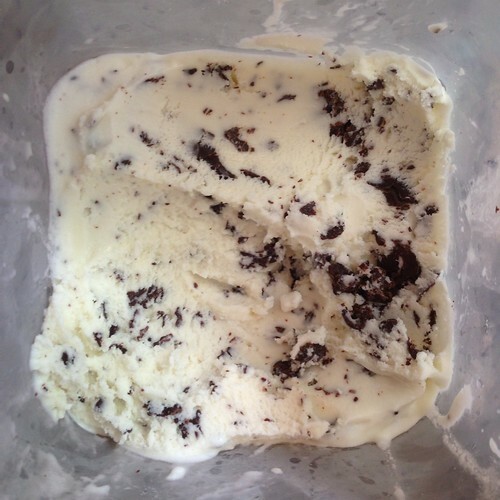 It didn't stop me from trying out her other recipes, though, or adapting them, and I can definitely say that I'm a happy convert to her eggless homemade ice cream recipes. 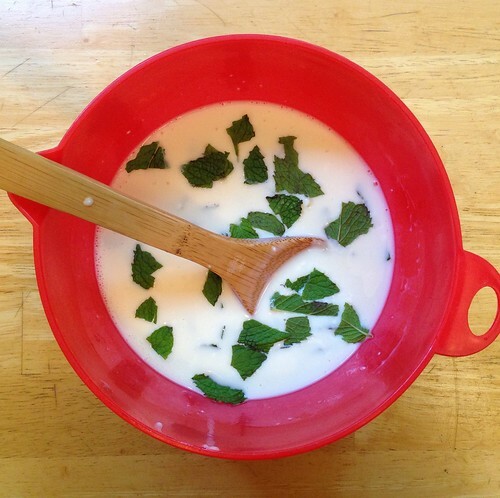 So when Paula gave me that bag of fresh picked mint from her backyard, I knew I wanted to try making Jeni's Backyard Mint Ice Cream. I've had the fresh mint ice cream from Toscanini's before, so I was pretty sure I knew what to expect: a slightly more herbal, even grassy, pure mint ice cream. And I decided I'd try to add some "dark chocolate freckles", which are basically made by streaming melted chocolate into the churning ice cream. I've kind of shied away from trying this because even though my ice cream maker has it's own condenser (so I don't have to worry about the ice cream base melting while churning), the opening for add-ins is not that easy to access. This is probably the only complaint I have about my Lello gelato maker. Combine the remaining milk, the cream, sugar, and corn syrup in a 4-quart saucepan, bring to a rolling boil over medium-high heat, and boil for 4 minutes. 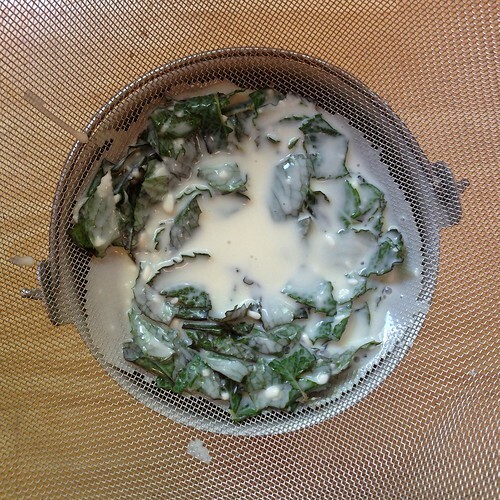 Remove from the heat, and gradually whisk in the cornstarch slurry. Bring the mixture back to a boil over medium-high heat and cook, stirring with a heatproof spatula, until slightly thickened, about 1 minute. Remove from heat. 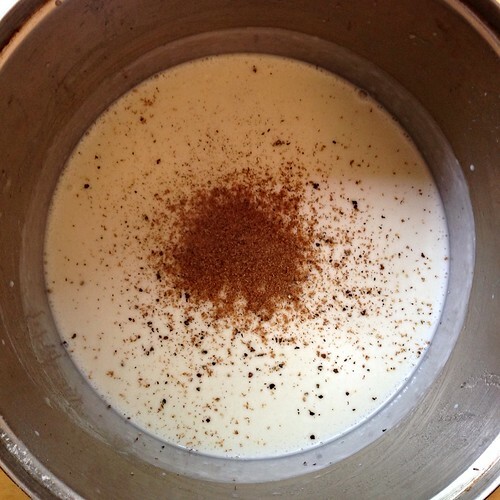 Gradually whisk the hot milk mixture into the cream cheese until smooth. Add the mint. 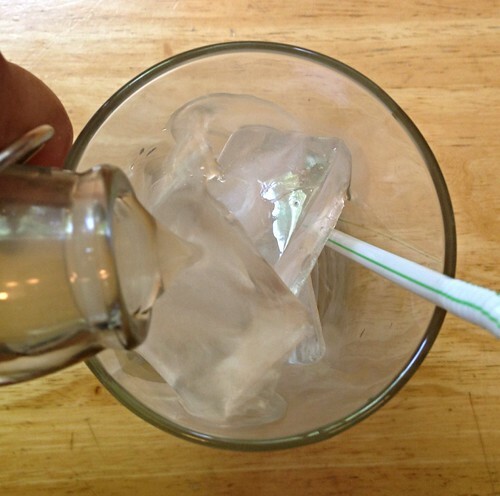 Pour the mixture into a 1-gallon Ziploc freezer bag and submerge the sealed bag in the ice bath. Let stand, adding more ice as necessary, until cold, about 30 minutes. Refrigerate to steep for 4-12 hours. Strain out the mint. 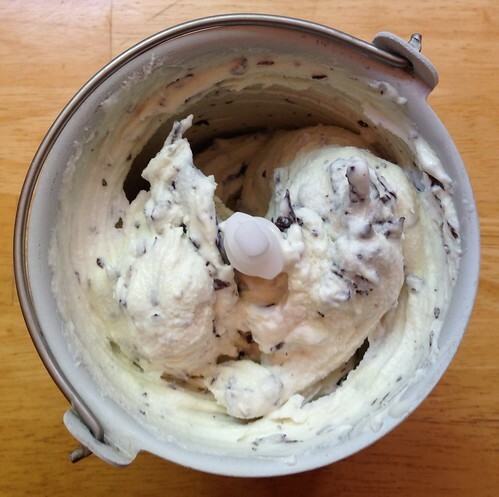 Pour ice cream base into the frozen canister of your ice cream maker and begin to spin the ice cream. Meanwhile, melt the chocolate in a double boiler. Remove from the heat and let cool until tepid but still fluid. 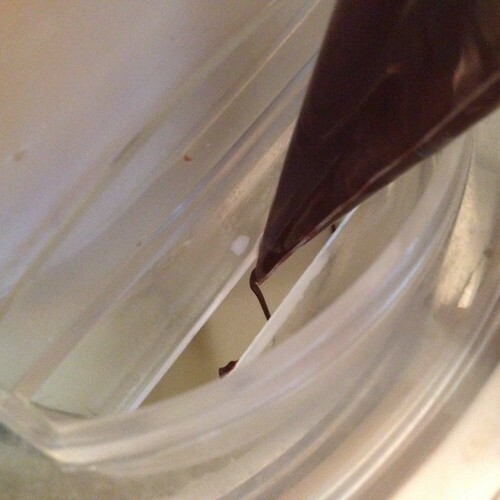 When the ice cream is thick and creamy and almost finished, drizzle the melted chocolate slowly through the opening in the top of the ice cream machine and allow it to solidify and break up in the ice cream for about 2 minutes. 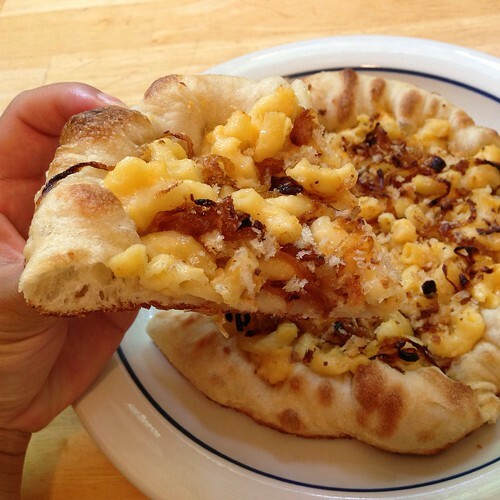 I ended up with some leftover macaroni and cheese, so I thought I'd try to make a version of Za's Mac 'n' Cheese pizza at home. 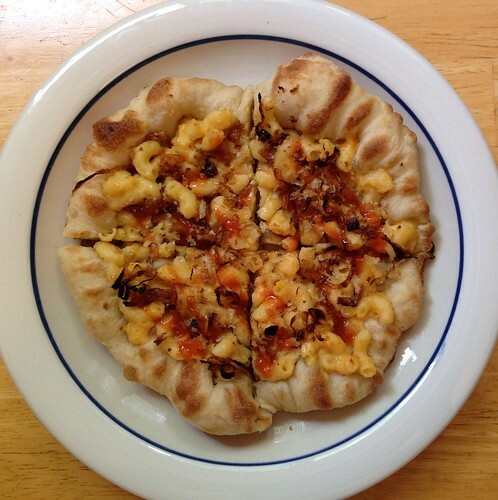 Their version adds some caramelized onions to the macaroni and cheese and is baked in crust more similar to a pan pizza than the thin-crust pizzas I've been making lately. To try to recreate that crust, I rolled out the dough instead of stretching it thin and decided to try making the pizza using the oven-fried method from the Modernist Cuisine at Home cookbook. 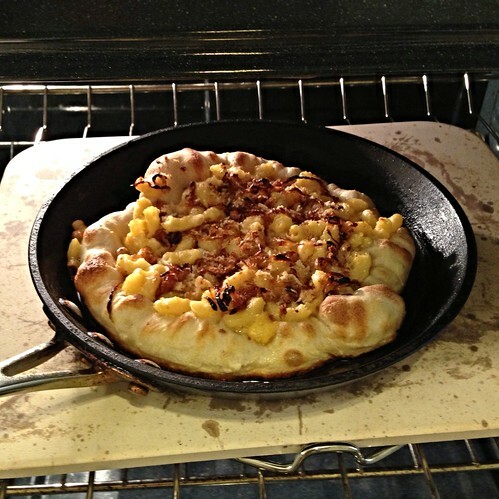 Warning: this involves maneuvering a soft, sticky mass of dough topped with macaroni and cheese into a smoking hot pan of oil. Proceed at your own risk. 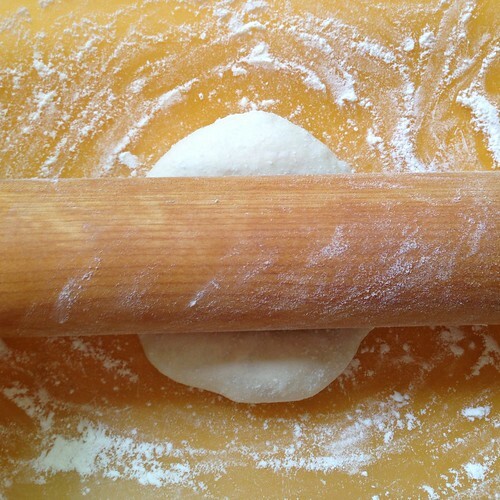 On a floured surface, roll the pizza dough out to a 10" circle. 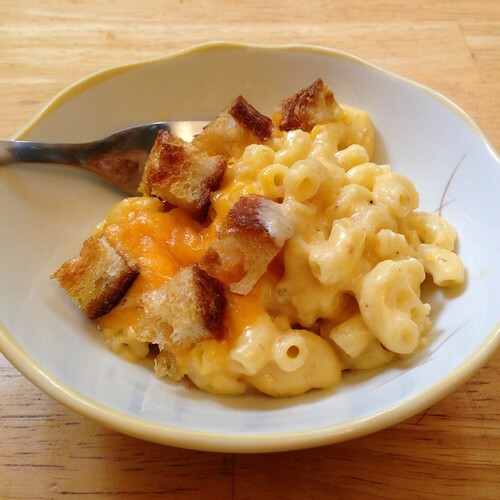 Top with the macaroni and cheese, caramelized onions, and bread crumbs. Add enough oil to completely coat the bottom of a 10" all-metal frying pan, the kind you can put in the oven without any plastic parts melting. Heat on high until the oil just starts to smoke. Carefully slide the pizza into the pan using a pizza peel or a flexible cutting board. Immediately transfer the pan to the oven. Bake for 5 minutes. After 5 minutes, turn the oven to broil and broil for two minutes. 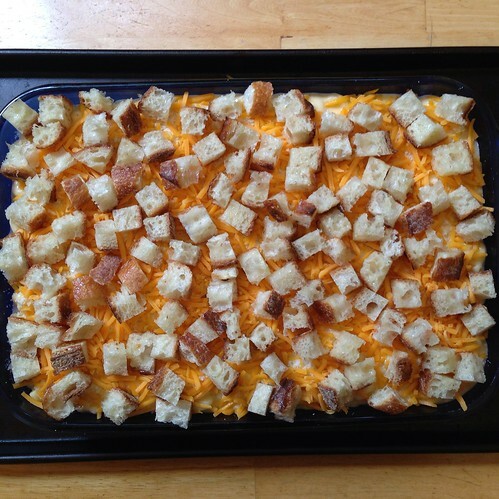 Remove from the oven and allow to cool slightly before cutting and serving. 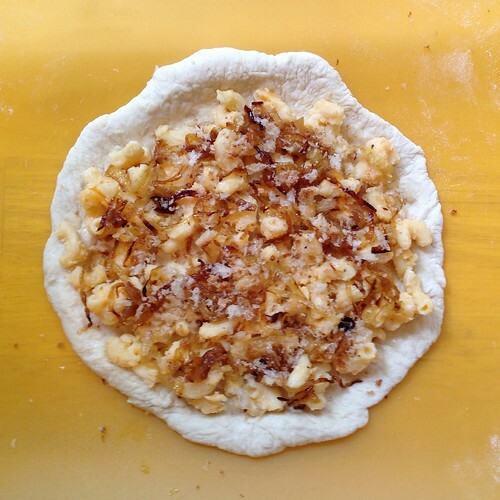 By keeping the pizza dough a little thicker and frying it in the pan, the crust becomes stable enough to stand up to heavier toppings like macaroni and cheese. And even though you'll get a nice crispy crust on the bottom, you'll be surprised at how much oil is left in the pan, i.e. how little oil is absorbed by the pizza dough. I like to add a little Tabasco or Frank's hot sauce on top just for an extra kick. ...And back to our regularly scheduled program! What was left of my four foot baguette was now so stale that the only thing it was good for was bread crumbs, and what better way to use bread crumbs (other than with fried eggs) than to top macaroni and cheese! I haven't always gotten the best results with recipes from Martha Stewart (e.g. the sugar cookie recipe I used for the rainbow cookies), but her recipe for macaroni and cheese is so tried and true that I had to use it. This is pretty much a no-frills recipe: straight up macaroni baked in a cheese sauce with only some buttered bread crumbs for garnish. I was tempted to add caramelized onions, herbs, and at the very least, use some bacon fat in there, but I resisted (mostly because I was bringing this to a potluck and there were going to be some vegetarians there). 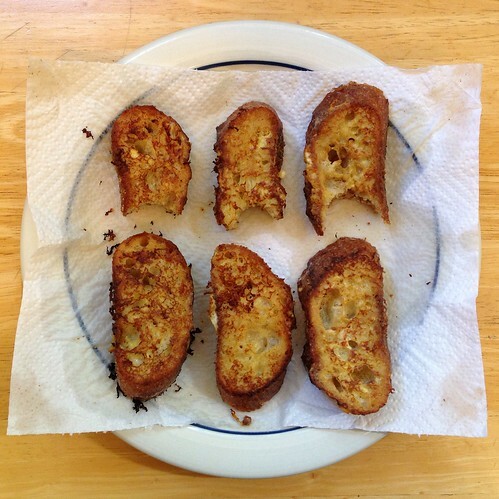 The only change I made was that I used the last foot or so of my baguette instead of white bread for the bread crumbs. Heat the oven to 375ºF. Butter a 9"x12" baking dish; set aside. 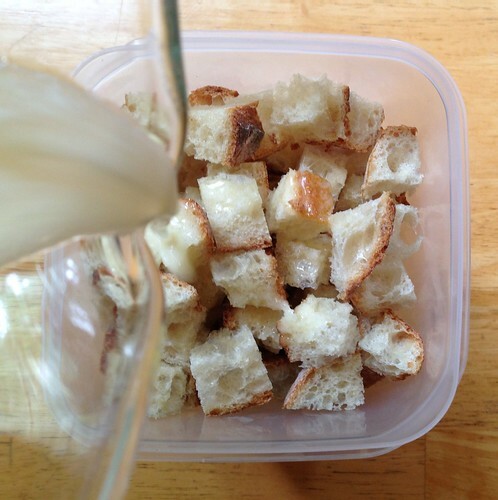 Place bread pieces in a medium bowl. 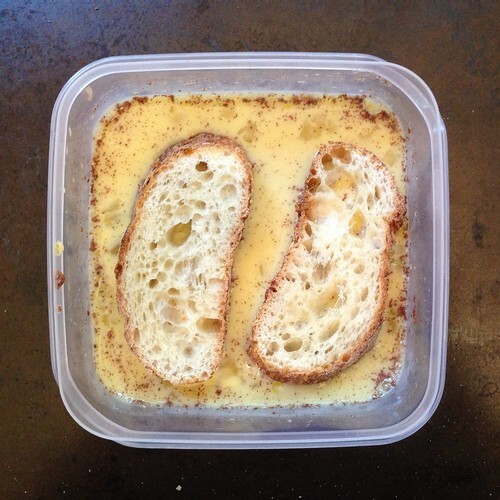 Melt 2 tablespoons butter, pour over the bread, and toss. Set the breadcrumbs aside. In a medium saucepan set over medium heat, heat milk. 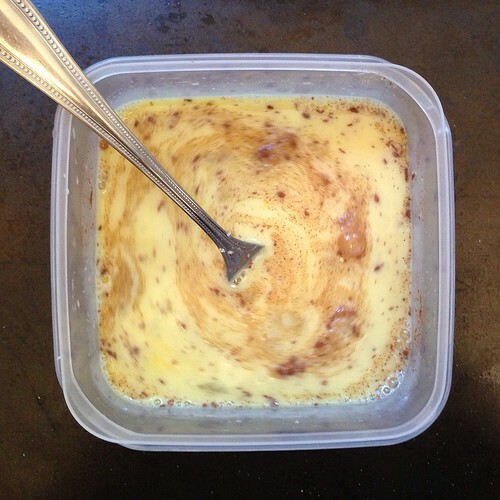 Melt remaining 6 tablespoons butter in a high-sided skillet over medium heat. When butter bubbles, add flour. Cook, stirring, 1 minute. Remove the pan from the heat. 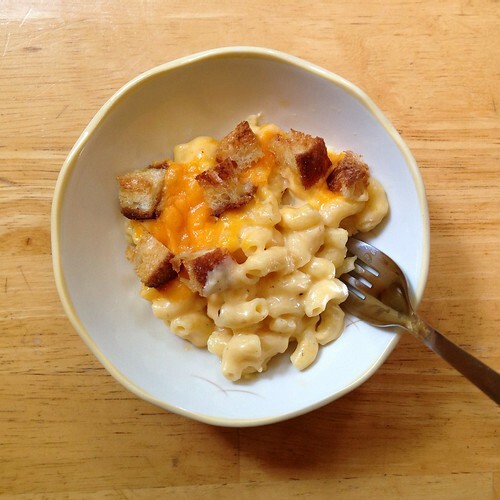 Stir in salt, nutmeg, black pepper, cayenne pepper, 3 cups cheddar, and 1 1/2 cups Gruyere or 1 cup pecorino Romano. 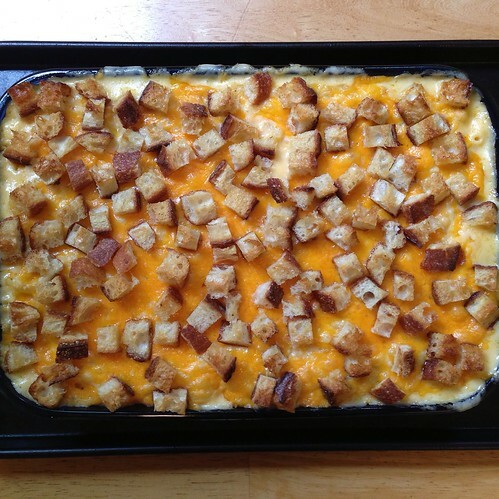 Set cheese sauce aside. 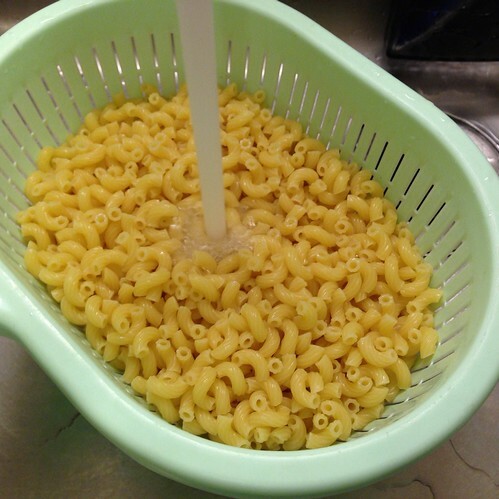 Transfer the macaroni to a colander, rinse under cold running water, and drain well. 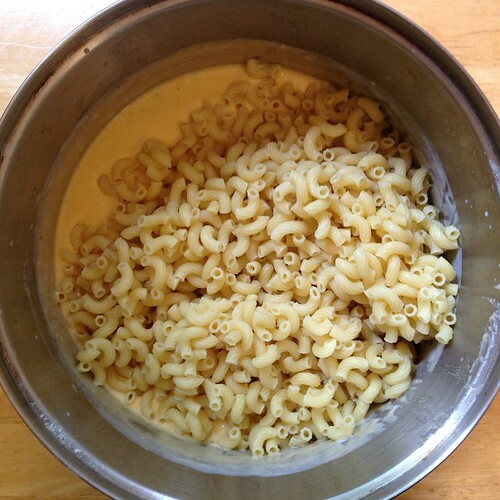 Stir macaroni into the reserved cheese sauce. Pour the mixture into the prepared casserole dish. 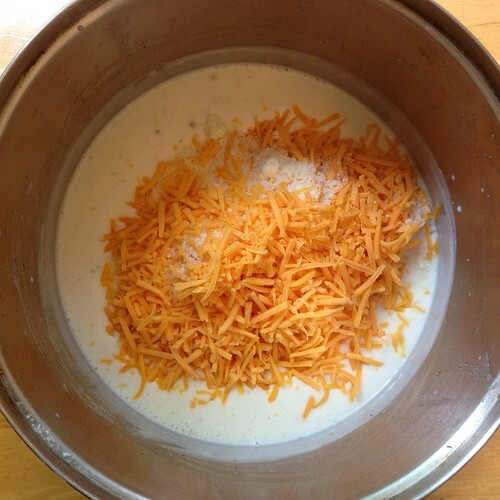 Sprinkle remaining 1 1/2 cups cheddar and 1/2 cup Gruyere or 1/4 cup pecorino Romano; scatter breadcrumbs over the top. Bake until browned on top, about 30 minutes. Transfer dish to a wire rack to cool for 5 minutes; serve. 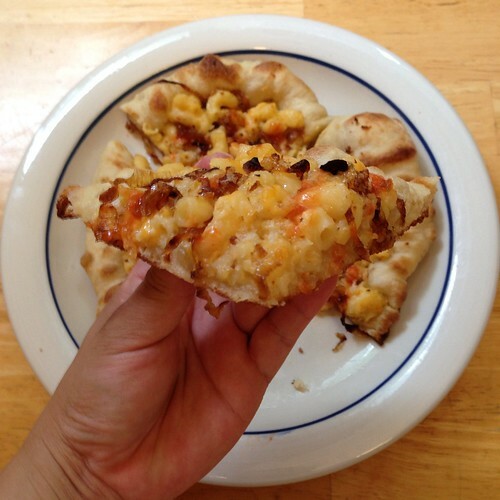 If you happen to end up with any leftovers, you can use them to make an oven-fried mac 'n' cheese pizza! I had my mac and cheese post all ready to go, but it's just way too hot today to think about turning on the oven or the stove. So here's another post I've been working on that seems a better match for today's weather. A couple of weeks ago, Food52 posted a video to show how to make The Best Lemonade You've Ever Had. Strangely, there was no recipe attached, just a method involving rubbing the lemons in the sugar to scent them before making a simple syrup out of the sugar. 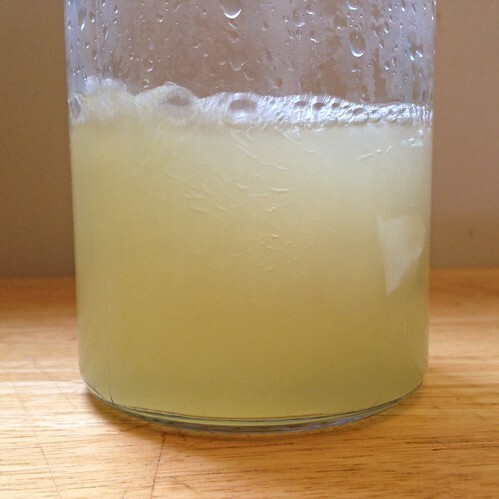 You had to dig into the comments to find that they recommend using equal volumes of lemon juice and simple syrup and that the simple syrup was made with equal volumes of the lemon scented sugar and water. I tried the method, and on a whim, decided to use vanilla sugar* instead of plain sugar. Wow. This was definitely the best lemonade I had ever had. It's been over a week since I made it, and I've made it several times since then, but I still can't put into words what makes it so great. The vanilla just elevates the lemonade to another level but in a subtle, understated way. Place the sugar in a wide bowl. One at a time, rub the outside of the lemons with the vanilla sugar. 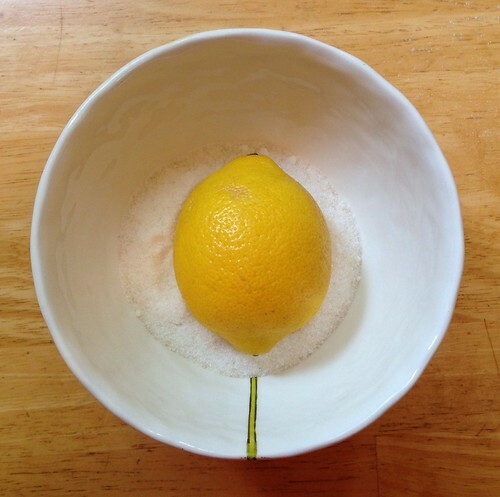 Wipe off any sugar that remains on the lemons back into the bowl. Roll the lemons on a hard surface to make juicing easier. 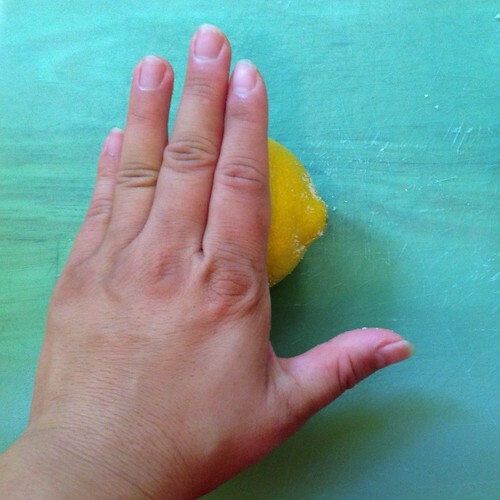 Slice the lemons in half and juice into a measuring cup. I was able to get a little more than half a cup of juice. 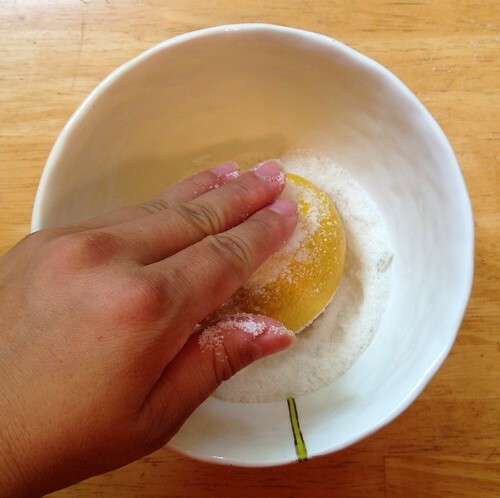 Add more sugar if you want to match the volume of lemon juice. 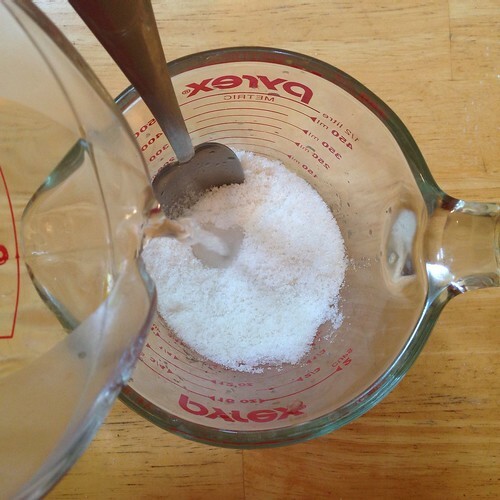 Add an equal volume of hot water to the sugar and stir until dissolved to make a simple syrup. 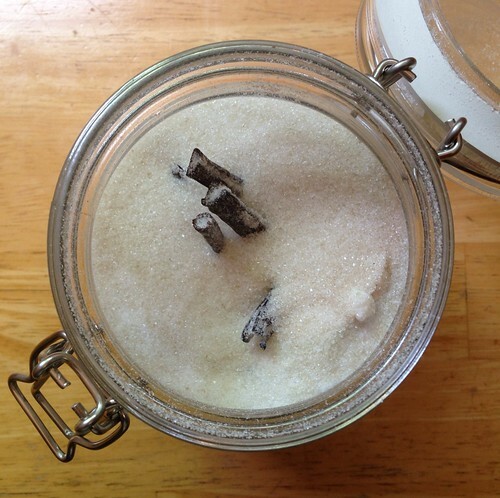 *To make the vanilla sugar, I've been adding the spent vanilla bean pods to an air-tight container of sugar every time I make something that uses fresh vanilla beans. 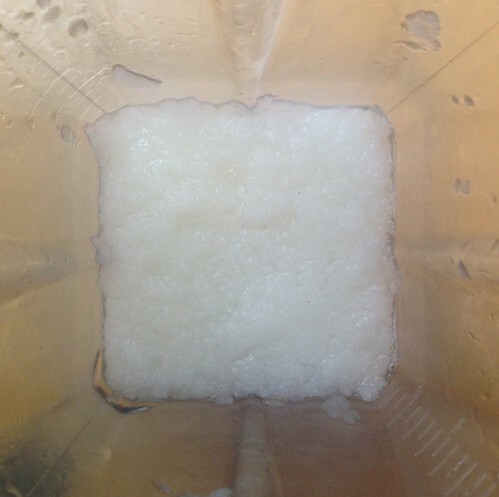 After letting it sit there for a few days, the sugar absorbs the scent of the vanilla and becomes vanilla sugar! 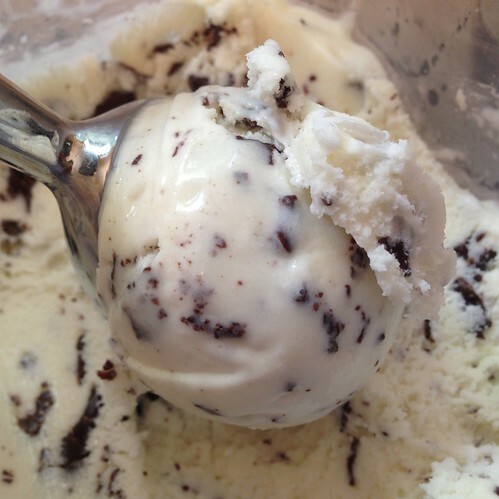 You can use it in just about anything sweet: cookies, cakes, ice cream, etc. Then a couple of days ago I get a text from my friend Paula asking me if I wanted any of the mint she and her family had just picked from their backyard! I immediately accepted even though I wasn't sure what I would do with it yet. 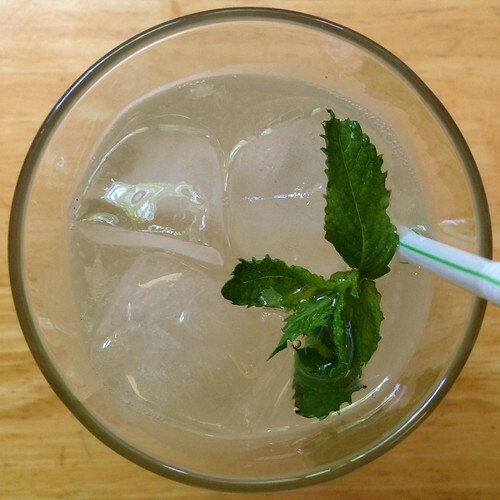 Then when I was making my third batch of lemonade in probably as many days, I started wondering if maybe I could rub the mint with the sugar and add some mint flavor to the lemonade that way. 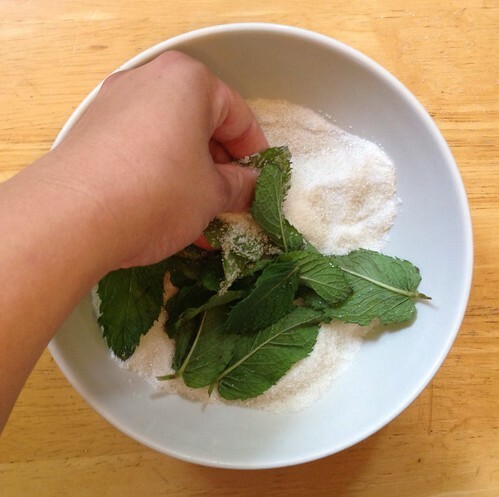 So after rubbing the lemons in the sugar, I dropped in a handful of mint leaves and rubbed those all around. I left the leaves in the sugar while pouring the hot water in and let it steep for a bit before straining out the leaves. I found that I was able to extract a lot of the mint flavor this way without having to leave the mint leaves in the actual lemonade. 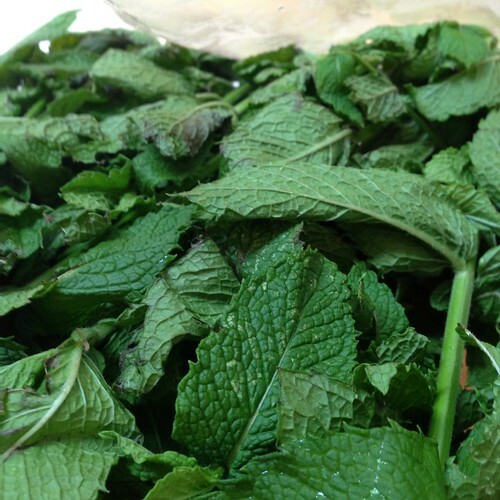 And if you really like the taste of mint, I'd recommend tearing the mint leaves up before adding them to the sugar to release even more oils. 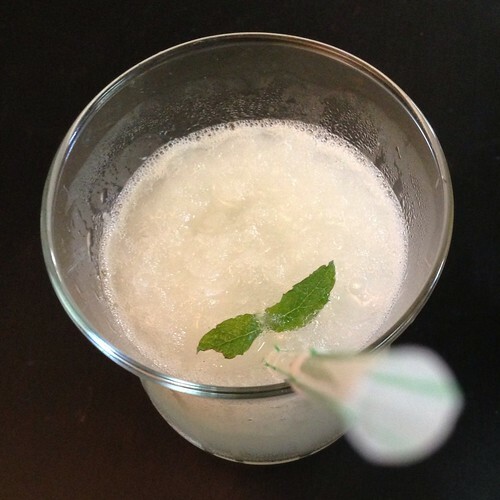 To take it one step further, I decided to blend the mint lemonade with some ice to make a mint lemonade slushie, inspired by Ilene's post. I was now down to a little over a foot-and-a-half left of my once four foot baguette, and the bread was now sufficiently stale to make French toast. But which French toast? 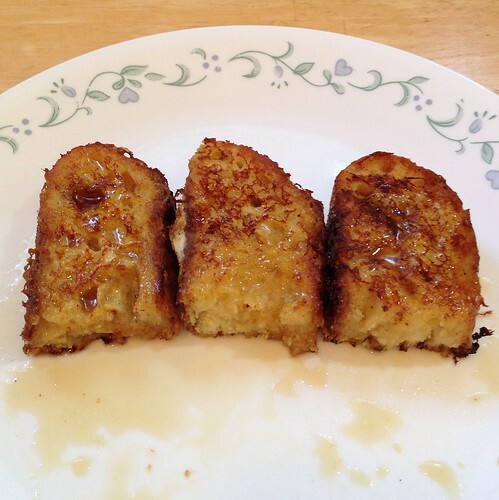 Molly from Orangette swears by frying her French toast in oil whereas the popular consensus is to use butter. I decided to compare the two for myself, taking the extra step of browning the butter first for some added flavor. And since I had some leftover bacon fat from making the BLTs, I figured I'd try frying some French toast in that as well. 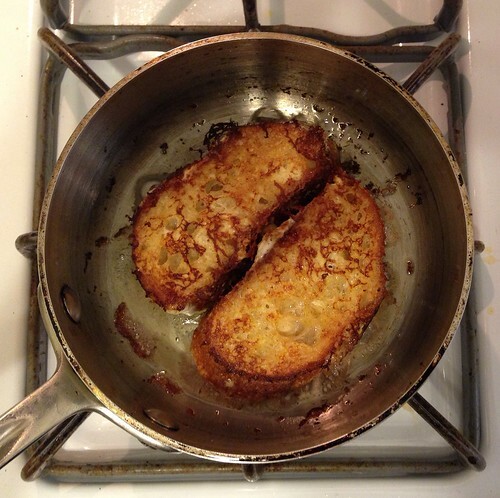 What we have now, my friends, is a French Toast Face Off. As you can see, isn't a lot of difference in the three visually. But once I started eating them, there was a world of a difference. 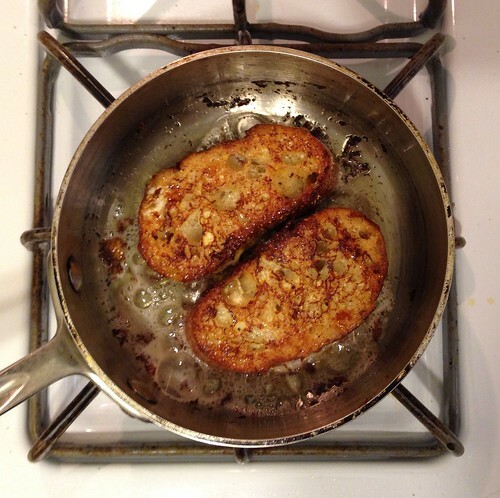 The browned butter-fried French toast was the most unremarkable of the three. It didn't taste bad, it just didn't shine, and I couldn't even really taste the browned butter (although that might just be me because I can almost never taste browned butter). 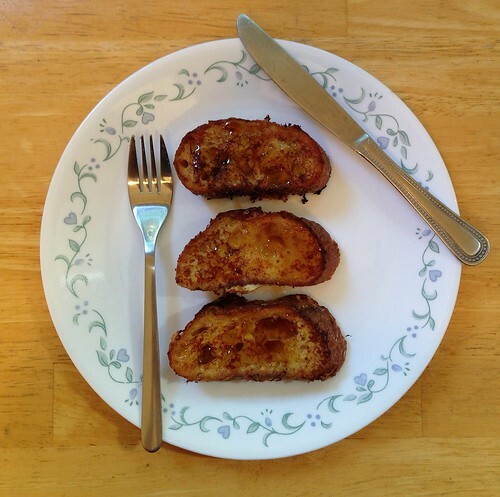 The winner of the three in terms of flavor was definitely the bacon fat-fried French toast. This may come as no surprise since I love bacon, and you could definitely taste the smoky, salty flavor come through in full force here. Place a large skillet, preferably cast-iron, over low to medium heat, and add enough oil to completely cover the bottom of the skillet. 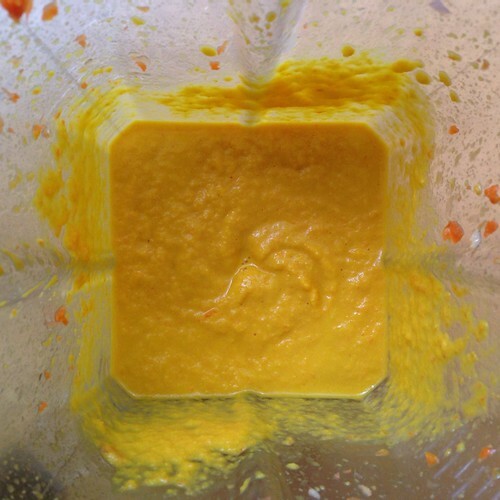 Two or three at a time, add the bread slices to the egg mixture in the bowl, allowing them to rest for a minute or two on each side. They should feel heavy and thoroughly saturated, but they should not be falling apart. When the oil is hot, place the slices in the skillet. 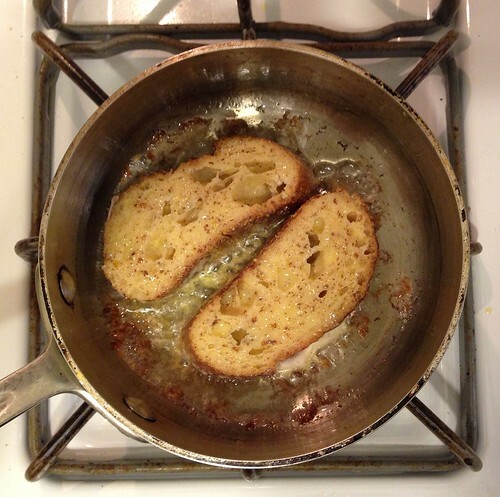 They should sizzle a bit, and the oil should bubble lightly around the edges of the bread; take care, however, that the oil is not too hot, lest the egg mixture burn. Cook until the underside of each slice is golden brown, about 2 minutes. Turn the bread, and cook until the second side is golden, another 2 minutes or so. 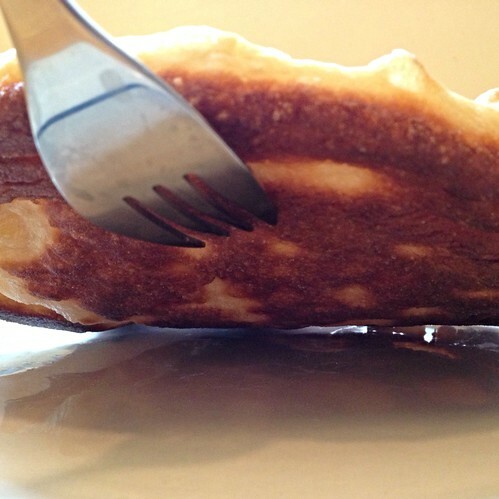 Remove the bread from the skillet to a plate lined with a paper towel, allow to rest for 30 seconds or so, and serve immediately—with maple syrup, of course.